The Advising, Retention and Career Center exists on campus to provide centralized support for students. Our advisors are here to help you select your major, create your four-year graduation plan, and explore careers. Our Career Counselors assist you with finding internships, creating your resumes and more. After taking the time to gather data and research on the best ways to provide academic advising, UW-Eau Claire began a model of four-year advising that aligns incoming students with one advisor for all of their time here. 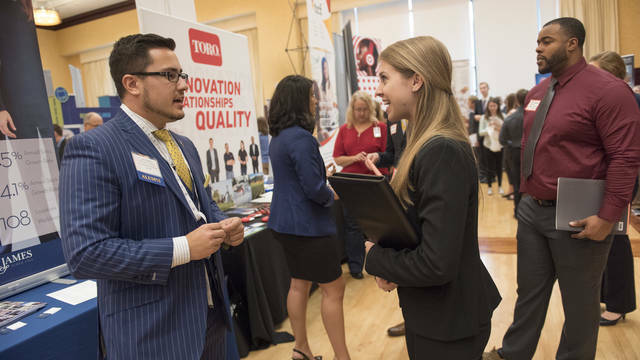 They will also be paired with a faculty advisor in their major, and a career counselor when they are ready to begin looking into internships, career guidance and job searches. select and declare a major. stay on track for expected graduation date. The Advising, Retention and Career Center is also home to UW-Eau Claire's Career Services and Service-Learning. This is an integral part of the guidance Blugolds receive on their path to academic success. During the course of their degree, students participate in 30 hours of service-learning which engages them with members of the community in mutually beneficial ways. The projects that fulfill this aspect of the Blugold education apply the concepts and principles from student coursework in meaningful and interactive ways in the service of others. Career Services helps Blugolds with everything from creating a resume, finding on-campus employment, securing an internships, and ultimately landing that first job after gradation. With career fairs and on-campus interviewing taking place multiple times a year, you will have a great head start in finding that dream job once your degree is in hand. The talented staff of Career Services at UW-Eau Claire are here to help you explore majors, research careers, find and apply for internships and land that first job. Are you ready to contribute to the world around you? Active citizenship allows you to learn skills, investigate careers and build confidence. And it feels great to give back, too! All Blugolds complete 30 hours of service-learning before graduating. Which advising model you are in determines the process for changing major. To be prepared for your meeting in either advising situation above, you should create, review and bring a copy of a “What if” degree audit. Students who started before Fall 2016 who have a faculty member as their primary advisor. To change majors you will contact the department, which sponsors the new program that you are looking to add. They will schedule an appointment for you with the appropriate person. You can find information on running a “What-if” degree audit here. Students who started in Fall 2016 or later have an advisor in the Advising, Retention, and Career Center and that is the contact for changing major. You can find information on running a “What-if” degree audit here.